The Soho Jacket For $349. Ombré Dress Now $55 Only!! Wild Poppies Sundress Now $99!! Save up to 40% During the Semi-Annual Winter Sale!! 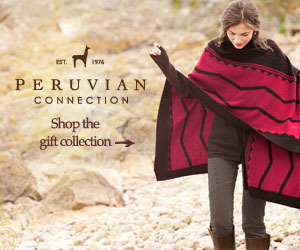 Peruvian Connection has been dedicated to the preservation and perpetuation of luxurious textile designs from all over the world. Three times a year, we produce a new and entirely original collection of garments for women and men, including exquisite, one-of-a-kind art knits.